Our Antique Mall Point of Sale (POS) Software - is the #1 Antique Mall Software Sold for Antiques Malls, Craft Malls and Consignment Shops for simplicity and ease of use. The Antique Mall FastTrack POS Software Athena will manage your entire Antique Mall business effectively, efficiently and greatly minimizes Antique Mall Management time. Perfect for small or large Antiques Malls, Consignment Malls and Craft Malls. Our Antique Mall Point of Sale Software Product is a complete product to track and manage unlimited sales for you and your Vendors, Dealers and Consignors as well as to manage and maintain your own inventory with images for sale. The Antique Mall FastTrack Software and the Complete line of AAIN Software Products are in more malls and businesses and rated #1 by Our Users and Trade Publications Worldwide. 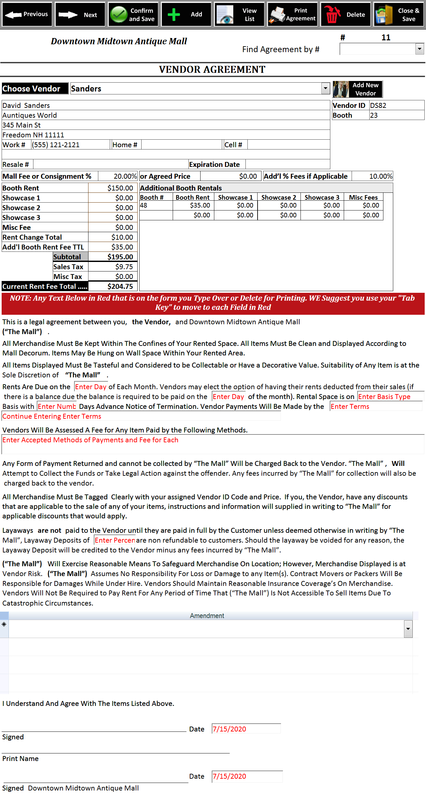 Order A FREE EVALUATION COPY of our Antique Mall Software Risk Free. • Ability to Post Daily Sales Information On-Line For Your Vendors • Automatically Calculates Taxes, Mall Fees, Credit Card Fees, Dicounts and More • Ability to pass on Credit Card Fees to Your Customers rather than your Vendors, Dealers or Consignors. • Automatically Tracks and Calculates fees owed to Mall or Vendor and Consignor including commissions, booth rentals, advertising, equipment rental, workcredit, credit card charges and more. 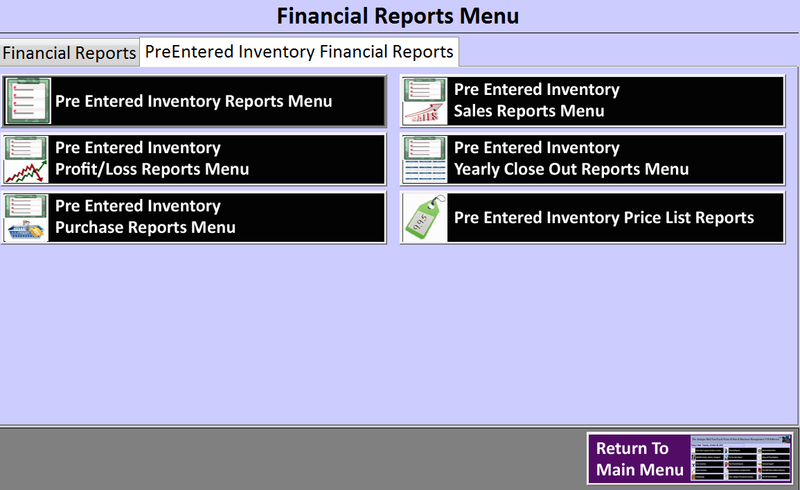 Over 700 built-in reports, detail reports, summary reports and quick reports. 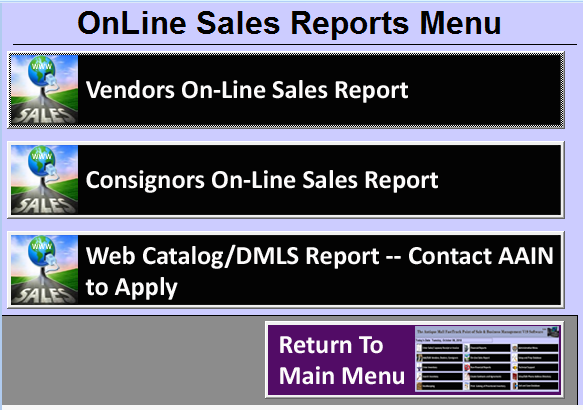 A partial list of reports include close out settlement reports, sales reports, layaway reports, vendor reports, tax reports, bookkeeping reports, inventory reports, expense reports, consignment reports, floor plans, rental reports, contracts, PLUS YOU CAN POST SALES REPORTS FOR YOUR VENDORS AND CONSIGNORS ON-LINE AS WELL AS CONSIGNMENT INVENTORY FOR SALE WITH A FREE SHOPPING CART and so much more. Reports, Memos, Agreements, Labels all built-in that help you manage your business efficiently and effectively. 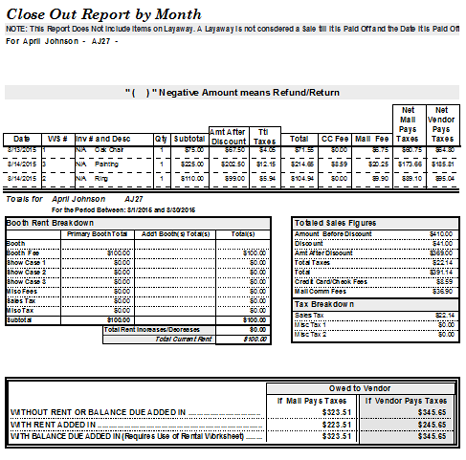 Automatically generate: Sales Reports; Bookkeeping Reports; Point of Sale Receipts and Invoices; Customer Reports; Mall Reports; Vendor Reports; Financial Reports; Layaway Reports; Floor Plans; Directories; Contracts; Gift Certificates; Consignment Reports; Customer Wish Lists; Consignment and Commission Agreements; Sales Tax Reports; Inventory Sales, Purchase and Profit/Loss Reports; Create Price Tags with images; Mailing Labels; On-Line Sales Reports; Plus Many others as well. 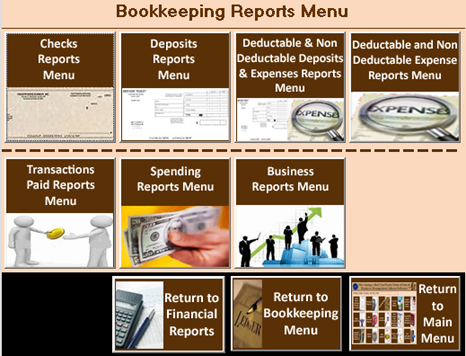 Track all your business expenses with our Bookkeeping Module (handles multiple accounts). Write Checks, Reconcile your Business Account and more. Editable and Definable Drop Down Fields to list your expenses. 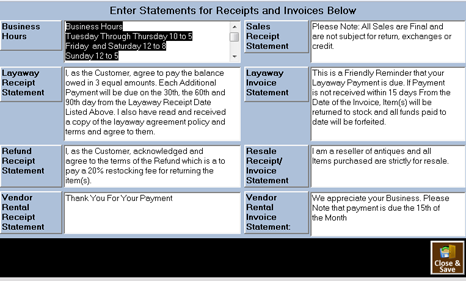 Create Receipts/Invoices for Sales, Layaways and Returns. Handles Split Transactions and calculates change. Easily define and prep fields such as Tax percentages, Receipt/Invoice Terms, Credit Card percentages, Create Floor Plans and More. Add your Own logo for Receipts/Invoices, Memos and other reports. 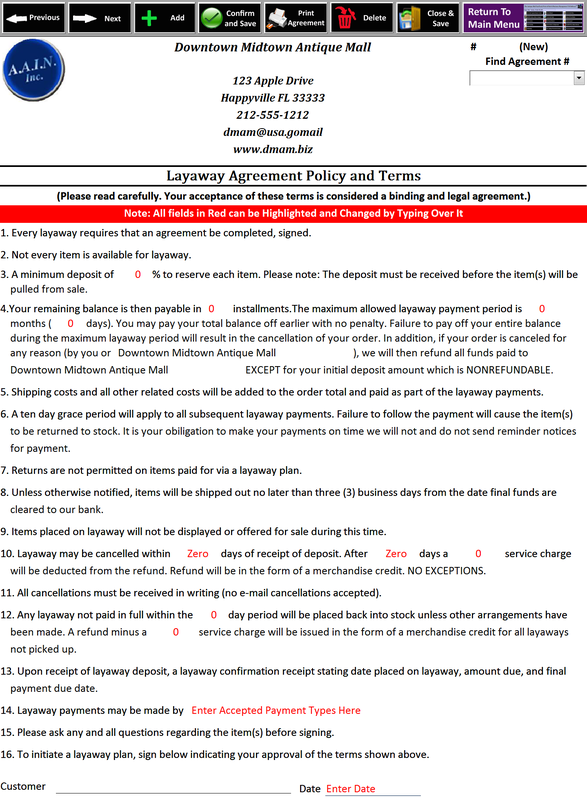 Create and Edit Terms and Statements for Receipts and Invoices at any time. 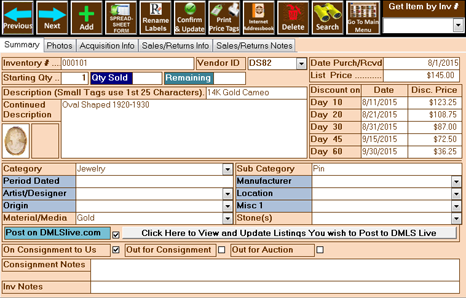 Enter and Manage Consignment Inventory with the ability to rename field labels. Define unlimited Categories as well as other fields with drop downs to maintain accuracy. 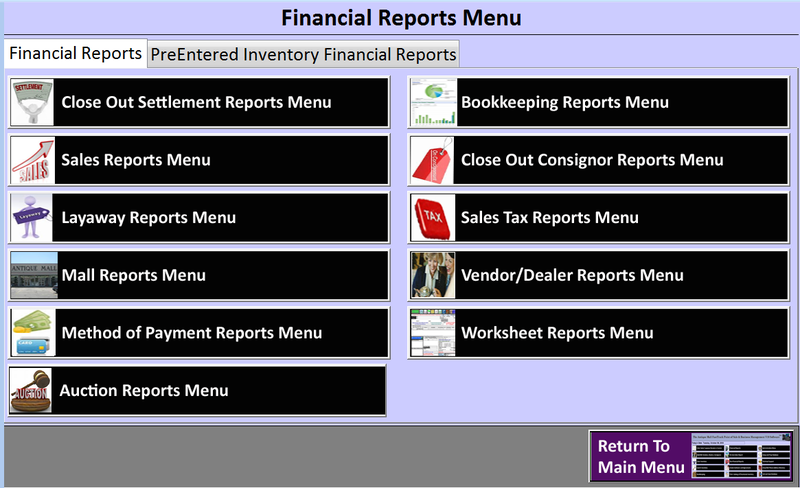 Track Consignment Inventory Sales, Purchase, Profit/Loss in a large selection of reports. 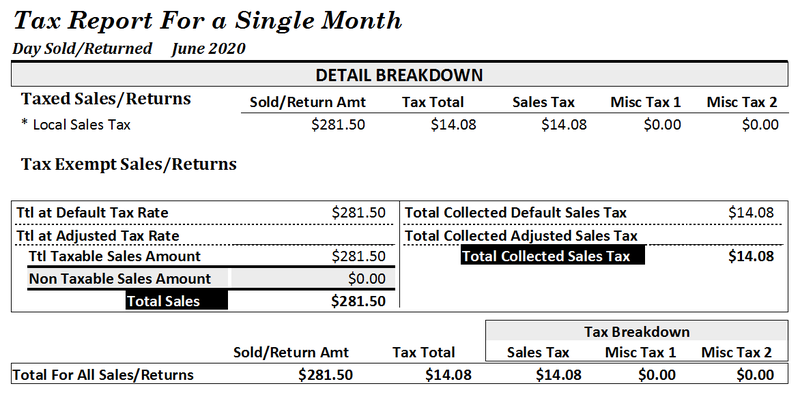 Print Sales Tax Reports for a Day, Month, Quarter or Year. Password-protected access to your sensitive business management areas. Multi-Level Security, password protected by you, the mall, who controls access to both the system and its private administrative functions. Track Employee Information * Powerful Keyword and Group Searching * Built-In address book where you can e-mail or Dial and speak directly from the software * Walk-Through Guide quickly familiarizes you with using the software, so you master it, easily and comfortably * FREE Technical Support for 90 days. Personal attention given to assist you on any questions and needs you might have * Optional Maintenance Contract available for continued technical support. Plus many other features not listed. 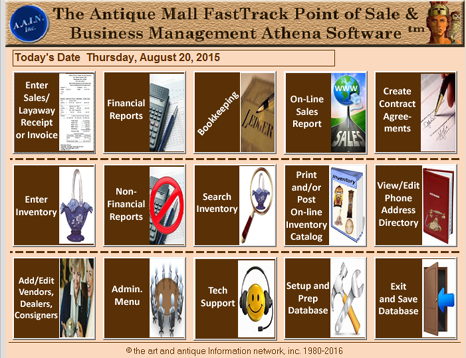 The Antique Mall FastTrack Point of Sale and Business Management Software Athena TM was designed by a panel of Antique and Computer professionals to maintain simplicity and ease. The Art and Antique Information Network, Inc. (A.A.I.N.) is confident that you will find The Antique Mall FastTrack Point of Sale and Business Management Software Athena TM a valuable investment at an inexpensive price for your Business ($479.95). We offer ninety days Free Technical Support and a FREE FUNCTIONAL EVALUATION COPY RISK FREE. 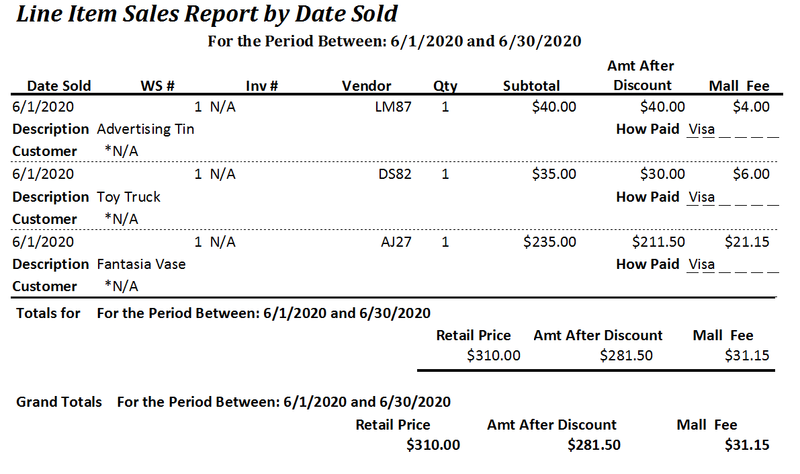 To receive your FREE FUNCTIONAL EVALUATION COPY of The Antique Mall FastTrack Point of Sale and Business Management Software Athena TM by contacting The Art and Antique Information Network, Inc. (A.A.I.N.) sales department by phone, by E-mail sales@aain.com , by clicking on "Order Free Evaluation Copy" listed below Risk Free. Include your name; company; address and phone number clearly and that you wish to receive a FREE FUNCTIONAL EVALUATION COPY. Recommendation: The Antique Mall FastTrack Point of Sale and Business Management Software Athena TM will run best on a Pentium-based, AT- compatible PC with a Super VGA monitor.